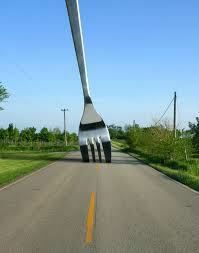 IS THERE A FORK IN YOUR ROAD? Usually when you think of a fork in the road, an intersection comes to mind with arrows pointing in different directions. This scenario creates confusion about which direction to go in. But what happens when the fork literally is in the middle of the road blocking both travel lanes? In this case the fork seems to prevent you from moving entirely. But it does not have to be that way. The only thing in your way is really yourself. When circumstances begin to spiral out of control and there appears to be no way out, your own creativity must kick in to find a solution. This past Halloween my furnace started to blow cold air. I had called the repair service I regularly use. The man came out and said he had it fixed. Two days later I was calling him back because my house was down to forty five degrees. The thought of getting a new furnace was lurking in my mind dreadfully. On his next visit he confirmed that my furnace had to be condemned. I was frantically trying to find a way to get a new furnace, when I happened upon a website of a service not too far from where I live. I explained my situation to the man. I told him I had been approved by a state agency out here affiliated with National Grid. My confusion was in how to proceed. Upon hearing my story he told me not to worry. Within two days of my talking to him my furnace was in and my heat was restored. All i had left of the miserable experience was the Seven hundred dollar electric bill I incurred from using space heaters. My fork in the road was removed by my ability to keep looking for an answer to the situation. You can do the same no matter what the obstacle that comes your way.